What does it mean to be righteous? In our culture, the answer varies. In the dictionary, to be righteous is to follow God’s law, to be ethical in behavior. While that sounds like a positive thing, popular use also gives negative connotations to righteousness. Sometimes people speak of the righteous as pompous, judgmental, overly pious, or close minded. The biblical definition of righteousness differs significantly from the official and popular use of the term in our day. In the Bible, righteousness has its origin in God and is primarily concerned with proper relationship to God. From the very beginning of the story, the God of Israel is righteous. God’s behavior is always and absolutely ethical; God by definition does the right thing, but the righteousness of God goes deeper than mere behavior. God lives in perfect relationship with creation and with all creatures. Life itself, and all that is beautiful or good in life, proceed from God. The great drama, even tragedy, of the Bible is that human beings fail to respond in kind. Instead, human being rebel against their relationship with God and choose rebellion and sin over goodness. The result is the sad and twisted story of our alienation from God, from one another, and from creation itself. The only light in this dark story of human failing is the absolute faithfulness of God Who never ceases to seek us out, Who offers perfect and redeeming love. As the Psalm proclaims, “The Lord’s are the earth and its fullness; the world and those who dwell in it.” Broken as we may be, the Lord remains true to us. The passage from Isaiah has its original context in the less consistent faithfulness of human beings. King Ahaz, King of Judah, faced significant military challenges from rival kingdoms. Two neighboring kingdoms demanded that Judah join them in an alliance to oppose the Assyrian Empire. Some of Ahaz’s advisors encouraged the move while others suggested currying favor with the Assyrians against the local rivals. In his deliberations, however, Ahaz forgot that the ultimate authority is the Lord. The Prophet Isaiah summoned him to trust in the Lord and rely upon the Lord’s promises rather than those of scheming earthly kings. When Isaiah offered a sign of the Lord’s favor, Ahaz dishonestly claimed that he did not wish to test the Lord. Recognizing this lack of trust, Isaiah spoke of God’s will and the sign that will demonstrate that will. It is the prophecy of that sign that places this passage among our readings today. Isaiah speaks of a moment of great hope, the birth of one who will be God’s presence with the people. If God is the source of righteousness, then Jesus is the face of God’s righteousness. In the first few verses of his epic letter to the Christians at Rome, St. Paul proclaims the gracious action of God in the sending of the Son. For Paul, Jesus is more than a great leader or example, He is intimately linked to the Father and sent to bring people back into proper relationship with God. The earth and its fullness belong to God; Paul and the Christians at Rome belong to Christ. Paul may speak of himself as a “slave” of the Lord without any diminishment of his humanity. To be a slave of the Son of God is to be lifted, not reduced. As Paul has been changed by his relationship with Jesus - so Jews and Gentiles and the believers of Rome now know the righteousness of God. Their relationship to God has been forever altered by the faithful love of Jesus. In submission to Him they will have grace and peace. That changed relationship with God affects our relationships with one another and with creation. We are told in the passage from Matthew that Joseph is a righteous man. In part, he is righteous because he is concerned to act ethically in accord with God’s law. He is also righteous because his observance of the law is tempered by compassion. He is a faithful man of Israel who lives in fidelity to the Lord. And in this moment, the Lord reaches out to Joseph through the angel to announce good news and present a challenge. Something essential is changing in the relationship between God and man and we see its effects in the immediate change of Joseph and his plans to divorce Mary. Joseph responds trustingly and obediently to the word of the Lord and his relationship to Mary feels the effect of his relationship to God. 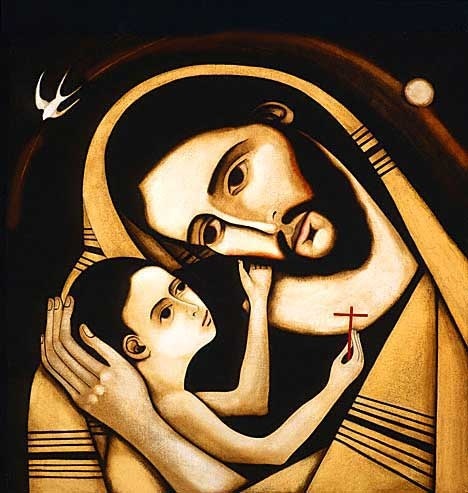 In Joseph, we have a beautiful model for discipleship in these last days of Advent. He demonstrates the importance of fidelity to God and openness to His Word. God is righteous, Jesus is the righteousness of God Who makes us holy by His grace.